Stephen Hayes, "Sonata," 2015, oil on canvas over panel, 60 x 60"
Landscape painting goes back well over a thousand years, and is one of the most prolifically explored subjects in the history of fine art. Yet, with an ever changing topography, and advances in mobility that enable ready access, landscape continues to serve as an abundantly inspiring subject full of fresh possibility. The five artists included in “Earthscapes: Contemporary Views of and from the Land” set out to prove that point, all capturing terrain both intimate and foreign, and all with unique styles that challenge yet harmonize. The artists’ distinct styles complement each other primarily through a tendency towards bright, vivid color and loose brushwork. The most restrained of the group is Gregory Botts, whose imagery is heavily influenced by the earth’s rotation. While his paintings seem reductive and controlled, they are influenced by the micro- and macro-changes in the scenery of the mountains and plains of the Southwest. The works here favor soft pastel hues contained in refined linear forms, creating a pleasing and welcoming interpretation of an objectively harsh landscape. Conversely, Kristopher Benedict displays the most open and expressive painting style, with energetic brushwork executed in bold colors. After living in an urban environment, Benedict seems unused to the uninterrupted scenery of his new suburban surroundings. His paintings are caught between the energy and chaos of city life and the serene tranquility of suburban vegetation. While vibrant, his paintings aren’t lacking in control. Benedict’s open style of painting encourages freedom and discovery, but natural forms and elements still manage to emerge out of the bold brushwork. Stephen Hayes and Forrest Moses represent a more traditional approach to landscape painting. 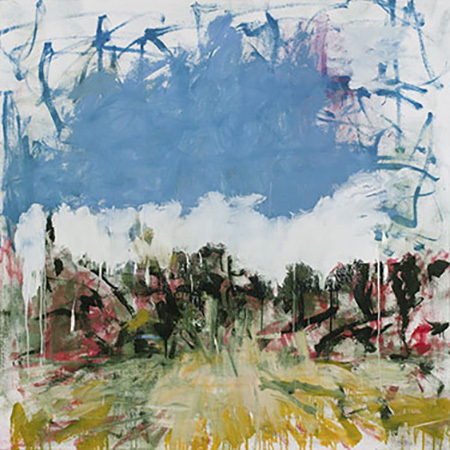 Inspired by his daily work commute and the sights he sees along the way, Hayes’ paintings feel intimate in their appreciation of specific trees and patches of land. His works evince a realist intent and a style of mark making that softens and loosens around the edges, reminding us of the artifice of paint. Moses deploys visual intimacy to motivate our observation of nature’s serene moments. His use of gesture and abstraction complements the other artists’ work. Shane Tolbert’s work, though stunning, is harder to place within the narrative of the exhibition. Tolbert’s two most prominent pieces in the exhibition, “Eros Control” and “Paloma,” are influenced by lunar and solar views and how their cycles effect the Northern New Mexico landscape. While this concept is interesting in the context of this show, the paintings strike an odd aesthetic balance relative to the rest of the work. Loose forms inspired by observation are contained in repeating circular patterns against a stark white background. The color, repetition and symmetry of Tolbert’s works are all well realized, but the geometric pattern strikes a different chord. While much of today’s landscape painting conveys an air of gloom and doom, this is a vibrant exploration of our continued search for beauty in a constantly changing physical and cultural environment.